The Ikon Pass is bigger and better than ever! For the 2019-20 winter, the Ikon Pass returns with 38 unique destinations, a new payment plan, and renewal discounts. Seek your next adventure by locking in the best prices of the 19/20 winter season. 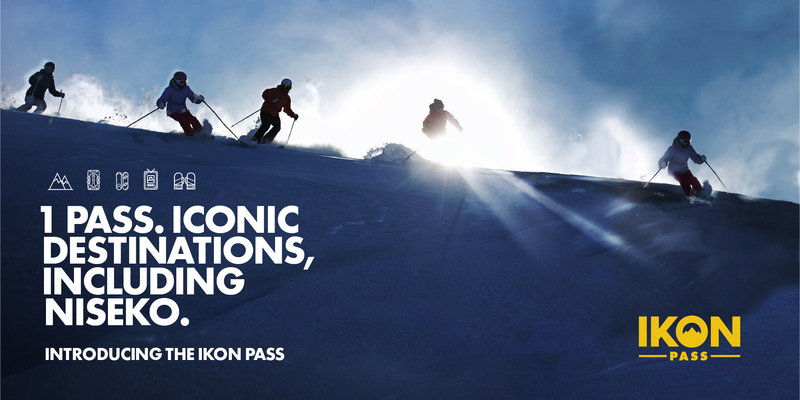 Ikon Pass, the new standard in season passes, connects the most iconic mountains across North America, Australia, and now Japan! The Ikon Pass offers the opportunity to access unique terrain, join a like-minded community, and experience the most iconic mountains around the world. To provide the best experience and value, Ikon Pass offers two passes with varying level of access and benefits: Ikon Pass & Ikon Base Pass. Please visit www.ikonpass.com for more details. • 10 x 25% discount 1-Day vouchers for family and friends. • 8 x 25% discount 1-Day vouchers for family and friends. • 10 Blackout dates: December 26-31, 2019; January 18-19, 2020; February 15-16, 2020. More pass details can be found on the IKON Pass Website. The Ikon Pass and The Ikon Base Pass have varying levels of benefits including unlimited access to some of the above resorts. Additional destination benefits and discounts are available at www.ikonpass.com. What Niseko United Lift Ticket Will I Receive With My IKON Pass? IKON Pass holders can redeem a 5 or 7 days pass, which will be valid through this season, with only the days you actually use are counted until it reaches your maximum. IKON Passholders can also purchase All Mountain pass at 25% off for family and friends, maximum for 8 or 10 days depending on your IKON Pass. The actual passholder needs to bring their IKON Pass to collect the FREE Lift Ticket. *the above information should be used as a guide. Please ask the lift ticket counter for more details.